This color full-resolution image showing the heat shield of NASA's Curiosity rover was obtained during descent to the surface of Mars on Aug. 5 PDT (Aug. 6 EDT). The 15-foot heat shield was photographed by Curiosity's MARDI descent camera. NASA's Mars rover Curiosity may seem like the strong, silent type, but the 1-ton robot was making a lot of noise during its harrowing Red Planet touchdown on Aug. 5. Curiosity phoned home throughout its daring and unprecedented landing sequence that night, giving its nervous handlers step-by-step status and health updates. The European Space Agency's Mars Express orbiter recorded some of this chatter, and now we can hear what Curiosity had to say. Sort of. ESA scientists have processed Curiosity's radio signals, shifting them to frequencies the human ear can hear. The recording compresses about 20 minutes of Curiosity signals into a 19-second clip that sounds suitably otherworldly. For a few seconds, it sounds as if a racecar is revving up its engine. Then that gives way to a strange electronic noise that calls to mind a 1980s video game — Pac Man, perhaps. The revving comes back, and then the recording stops. Mars Express was one of three spacecraft that stood by to observe Curiosity's landing, which saw the rover lowered to the surface on cables by a rocket-powered sky crane. NASA's Mars Odyssey and Mars Reconnaissance Orbiter (MRO) also kept tabs on Curiosity, the centerpiece of the $2.5 billion Mars Science Laboratory mission (MSL). Mars' rotation took Curiosity out of direct contact with Earth a few minutes before it actually touched down, so NASA was counting on these spacecraft to relay news about how things went. Both Mars Express and MRO must store information onboard for several hours before relaying it back to our planet, so they didn't break the big news on Aug. 5. And Mars Express' orbit took it out of range just before landing occurred. "We tracked MSL for about 28 minutes, then lost contact as expected just a few moments before Curiosity’s touchdown in Gale Crater," Michel Denis, Mars Express Spacecraft Operations Manager, said in a statement. "NASA now have this valuable data, and everyone here is delighted to have helped support Curiosity’s arrival at Mars." 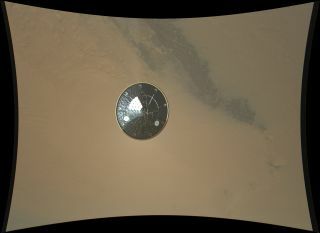 MRO, however, snapped a photo of Curiosity riding its parachute through the Martian atmosphere. The spacecraft has also captured images of the rover resting inside Gale Crater, and it spotted where Curiosity's sky crane, parachute, heat shield, backshell and ejected ballast came down.